I am not sure if peanut butter cookies are a thing in your family but my husband loves them. He especially loves the kiss kind too! Normally I would use chocolate kisses but when fall came around here they stocked a new kind, the pumpkin spice kisses. I was thrilled! I told myself I’d make them around Christmas into some kind of cookie. Here were are, day 3 and I have chosen to pair these kisses with peanut butter. 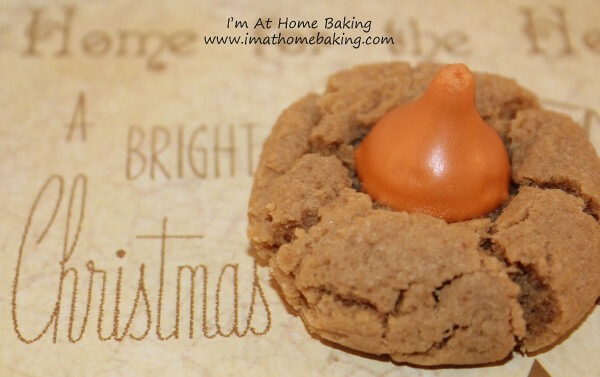 They are very light, soft and the marriage of the peanut butter and pumpkin spice is rather yum! One flavor does not take over the other. Simply put, delicious!! Cream together sugars, shortening and peanut butter. Add eggs, milk, and vanilla. Beat well. Stir flour, baking soda and salt in a medium bowl. Slowly add to peanut butter mixture. Beat well. Shape dough into 1-inch balls. Place on ungreased cookie sheet. Bake 8 minutes. Remove from oven. Press one kiss into the center of each cookie. Return to oven and bake an additional 3 minutes longer.